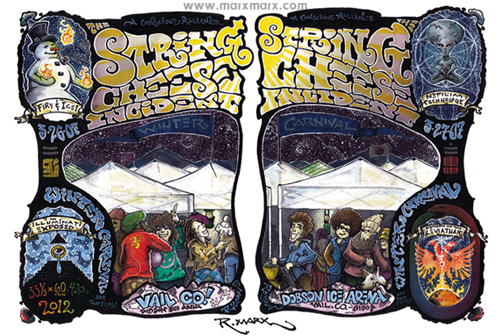 String Cheese Incident is once again gracing Colorado with Winter Carnival! I’m happy to be giving away two (2) pairs of tickets to the Thursday night show on March 10, 2011. There will be 2 winners for this contest, each will receive two tickets. Tickets are non-transferable as the winners’ names will be on the guestlist. Please only enter the contest if you plan to attend the show. Thanks Jeremy! Love String Cheese Radio! So glad you started it and continue to provide us with their music 24/7! Hopefully we’ll see each other again one of these days! Love ya! Best application I have for my IPhone, I listen to it daily at work from 8-5, I even sometimes go to sleep to it. Made it so I do not need to try and find every show recorded and gives me the dates and locations of my favorite concerts I have heard. All in all, you did great!